Transform Your Patio and Lawn Areas & Create a stunning Focal Point for the Whole Family with a Resin Fountain Powered by Solar, the Sound and Sight of Relaxing Trickling Water Adds a memorising Dimension. 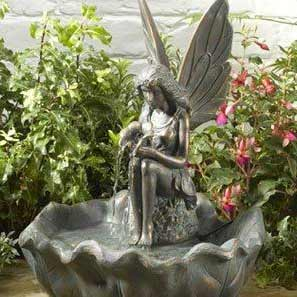 Powerbee offer some of the BEST Prices on Water Features, our Prices Include Guaranteed Tracked Delivery and VAT. We use 48 hour GPS Tracked Service, at NO extra cost. PowerBee Ltd have been Specialising in Water Features for nearly 10 years, we have Selected a practical affordable range, many of them are hand finished. Our Range of all inclusive Solar Resin Water Features, are designed to use Power very efficiently, our Fountains are Now Mainstream for Gardens all over the UK. We are one of the Longest Standing Solar Pump Specialists. We take great care in selecting every single product we sell, it must meet the Powerbee Standard of Quality which is High.